Twenty-four notes. Among the most recognizable twenty-four notes in America, regardless of genre of music one usually listens to. The history for this bugle call goes back to the Civil War. If one has spent time in any branch of the United States military, you’d most commonly hear Taps played to signal the end of the day, the official “lights out” notification. For almost everyone, however, the plangent sound of Taps is most familiar for being played in memory of those who have fallen in the service of their country. There is some debate about whether the repeated G-C-E in the third and fourth measures are played eighth/eighth/quarter note as written above, or as dotted-eighth/sixteenth/quarter note as appears on other versions of the sheet music. There is also some debate on whether it is better or preferred for Taps to be played by a single bugler or by two in so-called Echo Taps arrangement. 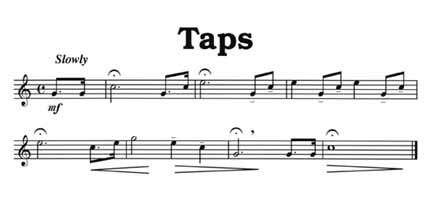 That said, I think I can safely say that there is no debate about the impact Taps (or Echo Taps) has when played live at a military funeral or other memorial service. I can think of no more appropriate musical tribute to the men and women who have lost their lives in the service of this great country than these simple twenty-four notes. So before you fire up the BBQ grill today, and regardless of your political leanings, say a prayer of remembrance and take less than a minute out of your day to listen to (and/or download for free) one or both of the following MP3’s (care of the United States Air Force Heritage of America Band (FKA the USAF Tactical Air Command Band) based in Langley AFB, Virginia). Tags: free download, Memorial Day, Taps. Bookmark the permalink.